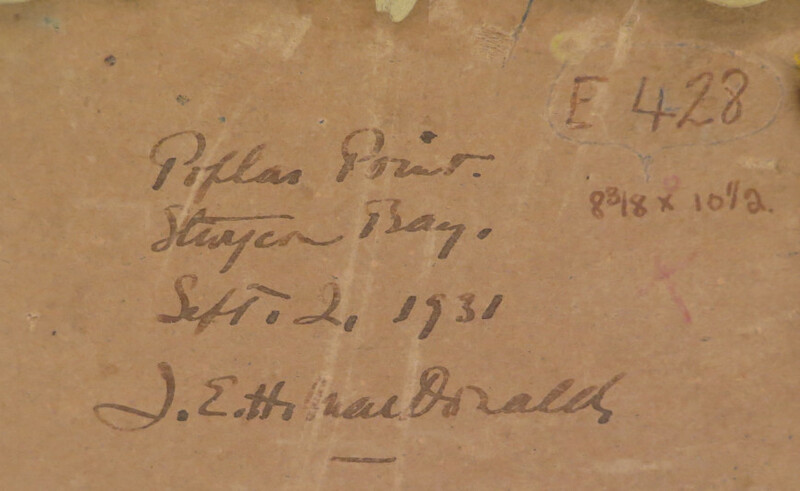 signed with initials, JEM (recto, lower right); titled, dated and signed in black ink, "Poplar Point, / Sturgon [sic] Bay, / Sept. 2, 1931 / J.E.H. 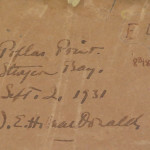 MacDonald" (verso, upper right); inscribed in red ink in an unknown hand, "E 428 / 8 3/8 x 10 1/2"
Acquired from the above by the present Private Collection, Toronto. 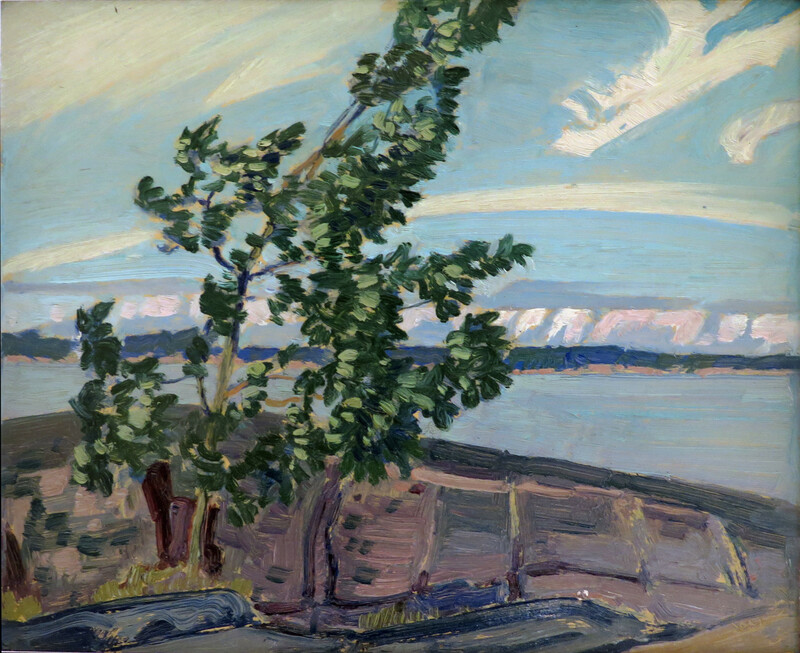 During a sketching tour to northern Georgian Bay in September 1931, MacDonald painted Poplar Point, Sturgeon Bay. Using an open and fluid brush, his late summer painting depicts a rugged shoreline punctuated by a cluster of poplar trees. 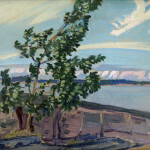 With an isolated foreground of trees on a rocky outcrop, a middleground comprising an expanse of water, a background with distant shores and powerful sky, Poplar Point, Sturgeon Bay is a classic Group of Seven composition that recalls some of the most recognizable Canadian paintings of the period. 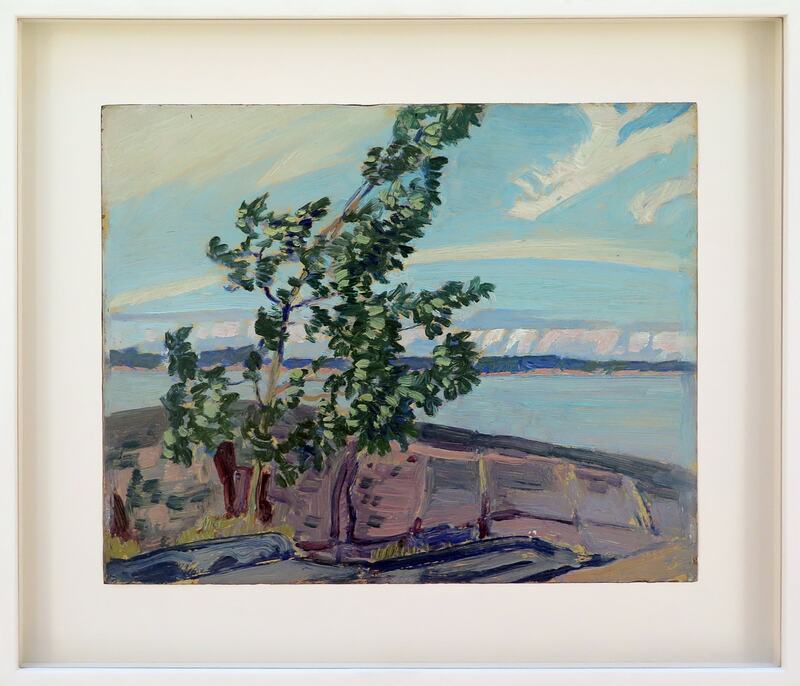 Such as Varley's Stormy Weather, Georgian Bay, Lismer's A September Gale, Georgian Bay or, going back further, Tom Thomson's The Jack Pine, and The West Wind. J.E.H. MacDonald sketching under the shade of a poplar tree during his trip to Sturgeon Bay in 1931. To express the elemental power of the gusting wind, MacDonald composes the leaves of his central subject with horizontal licks of blue and greens. Much of the foliage is composed with a laurel green so as to suggest the underside of windswept leaves, which are being illuminated by the sun. MacDonald's thick, excited marks reinforce the physical presence of the poplar and the heavy daubs of oil paint create an almost shimmering surface, reiterating its sunlit glow. The profile of the poplar tree unapologetically obstructs the horizon line and juts into a sky that is alight with a spectacular of sunbathed, tumbling clouds. The complex of mauves, blues, greens, and browns that compose the weathered rock face seem to erupt on the panel surface. One can readily imagine looking out toward a far off horizon, depicted by MacDonald in a subtle arrangement of blue and white, with the flicks of a most adept brush. 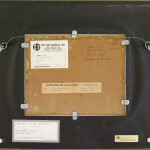 This particular view obviously intrigued MacDonald — a very similar composition is housed in The Thomson Collection at the Art Gallery of Ontario [Fig. 3]. 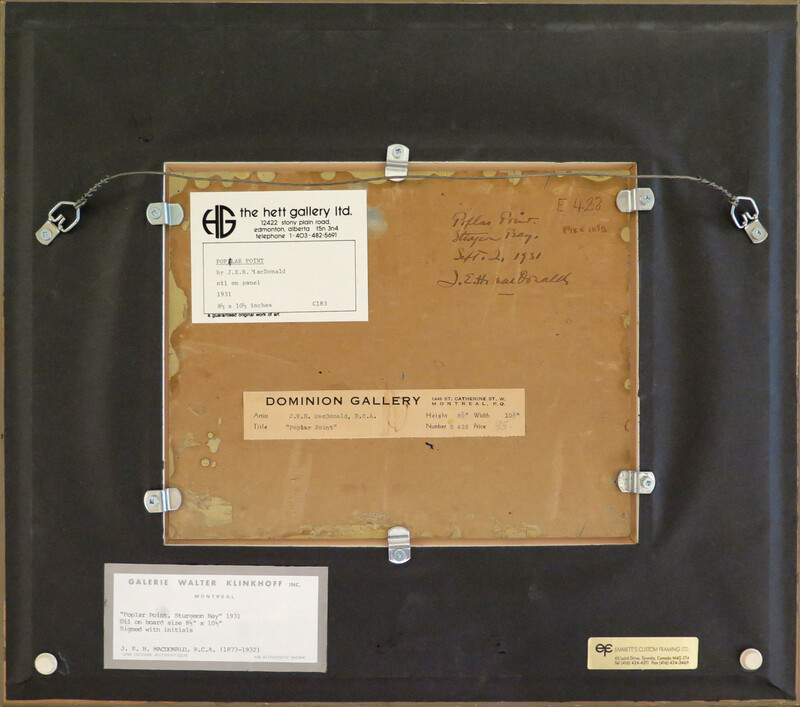 A comparative work can also be found at the National Gallery of Canada [Fig. 4]. “‘Mr MacDonald’s art is native — native as the rocks, snow or poplar trees that are so largely his theme. In these sketches there is a refreshing absence of Europe, or anything, save Canada, and J.E.H. MacDonald and what they have to say: and so deep and compelling has been the native inspiration that it has to a very great extent found through him a method of expression in paint as native and original as itself’”. J.E.H. 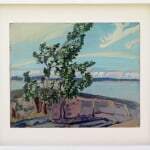 MacDonald, Poplars and Rock, Sturgeon Bay Near Pointe au Baril, 1931, oil on paperboard, 21.5 x 26.6 cm (8 7/16 x 10 1/2 in.) The Thomson Collection at the Art Gallery of Ontario, AGOID.103920, © 2017 Art Gallery of Ontario.